Effects: antiviral, antibacterial, antifungal, stimulates digestion, depurating, tonic, refreshing, immunostimulatory, cleansing the body of toxins, healing wounds, diuretic, insecticide. Benefits: For treatment of acne, oily skin and dandruff. Lowers blood pressure and helps to regulate the body's liquid balance, thus often used to fight cellulite, varicose veins and obesity. 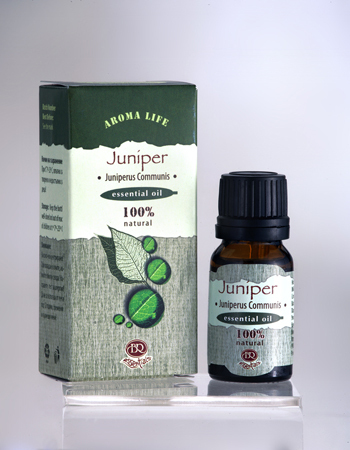 The Juniper essential oils has a proven tightening effect, eliminates stretch marks on the skin. It is used in cases of irregular menstruation, menstrual pain, rheumatism and arthritis. It has analgesic effect in colics, caused by indigestion. Blends well with: cedarwood, cypress, geranium, grapefruit, lavender, bergamot, vetiver, sage and lemongrass. Application: massage, baths, compresses, inhalation (aromatherapy lamp), after consultation with the aromatherapist. Attention: Essential oil with a strong action! Contraindicated for epileptics, hypertonic patients, nursing mothers, pregnant women and children under 12, as well as people with individual intolerance towards juniper, acute pyelonephritis, chemotherapy of cancer. It is not recommended before bedtime!